Another use of the this keyword, which refers to the current instance of a class, is to trigger Intellisense in Visual Studio so that you can see a list of members in the class. For example, let’s say that you’re writing some code for the Bark method in a Dog class. You want to call another method in the Dog class, but you can’t remember its name. You can just type this and a period (.). 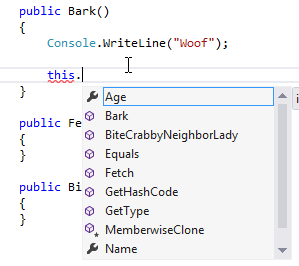 After typing the period, an Intellisense window will pop up to show you the members in the Dog class. You can then select the method that you want to call and Intellisense will remind you of what parameters are required.